Statistics – Lean Learning Revolution! This is great article from Samantha Cooney at Mashable.com on 20 January 2016. Data analysis has never been more popular and this post gives an overview of what jobs are hot! The best job in America comes with a handsome six figure salary — and has plenty of job openings. It came out on top of job search site Glassdoor’s its annual list of the Best Jobs in America, which was released late on Tuesday night. The survey ranked the careers by a job score between 1 and 5 (with 5 being the best) based on earning potential, career opportunities, and the number of job openings in that field. There are lots of improvements coming to YouTube. The one that caught my eye related to improved data analytics. This is a good article on Mashable about this subject too. While this post does not fall into what I would traditionally call ‘lean’ thinking, it does point out great ways to use statistics to interpret the world. Plus, Jay went to UGA for grad school… and as a former Bulldog myself, I felt duty bound to “Like” and “Reblog” this great post about the baseball team I’ve been following since 1966. 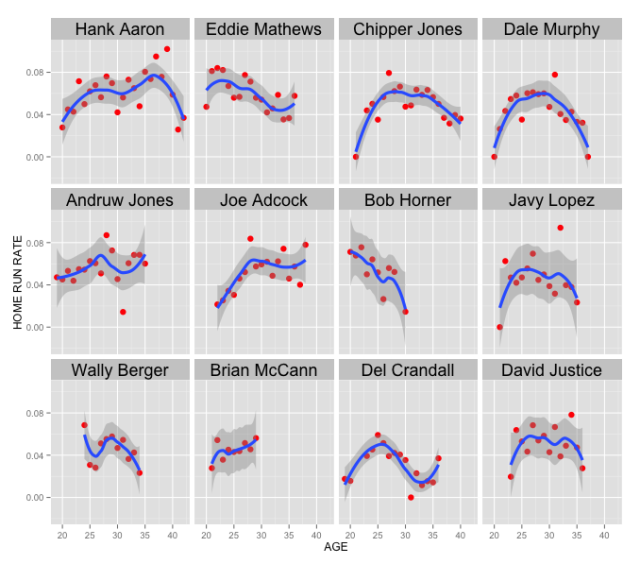 The home run rate (home runs divided by at bats) of the top 12 home run hitters in Braves history. Being a consumer of sabermetric analysis, a member of a fantasybaseballkeeper league, and a die hard Braves fan, the age of players is extremely important. You want youth with enough production that it makes sense to take the 23-year-old over the 30-year-old veteran. The University of Central Florida beat Baylor University in the 2014 Fiesta Bowl. SB Nation declared this victory, “the biggest BCS bowl upset ever”. I watched the game, and from the opening kickoff, it was clear that these two teams were equally matched. I love sports, and I especially enjoy American Football. Why did the pundits consider UCF’s victory an upset? #1: Experts discounted UCF’s 2013 accomplishments based on their schedule. UCF plays in the American Athletic Conference, not in a ‘power conference’ like the SEC or the PAC 12. They don’t even play in a former power conference like the Big 10 or Big 12. #2: UCF does not have a rich and storied football tradition. According to wikipedia, the University of Central Florida opened in 1968 as Florida Technological University, with the mission of providing personnel to support the growing U.S. space program at the Kennedy Space Center, which is located only 35 miles (56 km) to the east. Groupthink is the practice of thinking or making decisions as a group in a way that discourages creativity or individual responsibility. American football comentators fall into two categories: jocks and journalists. There are two subcategories of jocks, the players, and the coaches. Some, like the legendary Mike Ditka, were renowned as coaches and players. But when it comes to football expertise, there is a rigid hierarchy, jocks hold the trump card in every argument, coaches trump the journalists, and nearly to a man, everyone in this arena believes the ‘stats guy’ is a subhuman parasite who is hell bent on wrecking the noble game. Despite the popularity of Moneyball, and the success of the baseball teams using its principles, we continued to be fooled by what we see. Some people are willing to look past what they see to the facts. One of those people is Josh Friemel. Josh Friemel Nailed IT… with FACTS on 12/31/2013! I had never read Josh Friemel’s work until today, but I am impressed with his “pre-game” analysis of the Baylor vs. University of Central Florida Fiesta Bowl game. Josh writes for the Dallas Morning News’ sports blog… and in his December 31, 2013 post titled, What’s up with UCF? Five things Baylor fans should know about the Knights, he lays out a convincing case for UCF. He talks about their strong defense, how their offense is balanced, the passing prowess of UCF quarterback Blake Bortles and about the Knights’ lone loss to the University of South Carolina. He backs up each assertion with facts. Given time to reflect on the things Baylor fans needed to know about UCF must have lessened his zeal for the Knights since at lunchtime on New Year’s Day, Josh posted, Prediction: UCF can’t handle Baylor’s speed, Bears easily win first ever BCS bowl. Please don’t think I’m being hard on Josh. He was the ONLY person I could find in who had published anything remotely positive related to the UCF Knight team’s chance to beat Baylor. Confirmation bias (also called confirmatory bias or myside bias) is the tendency of people to favor information that confirms their beliefs. This is a difficult problem to deal with, since most of us are unaware of our biases, or worse, we are convinced that our biases are facts. I strongly recommend Chip and Dan Heath’s book, Decisive: How to Make Better Choices in Life and Work. It’s a great look at how we make decisions and how we can improve as individuals and as organizations. Know the Difference Between Your Data and Your Metrics?